Suffern, New York - Monday night, at the Mesorah Dinner, Artscroll announced the "ArtScroll Digital Library." We at RustyBrick are responsible for designing and developing the application software for mobile devices including the Apple iPad & iPhone. 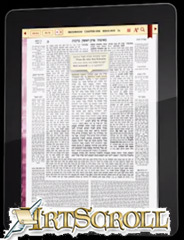 We are honored to be working with the premier publisher and seller of Jewish books, Artscroll, to build out this app. First, we will be starting with the ArtScroll Schottenstein Talmud. The ArtScroll Schottenstein Talmud will revolutionize how the Jewish world learns and studies the Talmud. By combining Artscroll's mastery of design, layout and content with our technical prowess, this application will change the world of Jewish study forever. Here is a video demo of what to expect in July 2012. ArtScroll is the official imprint of Mesorah Publications. Based in Brooklyn NY, the company has grown from one small book, a dedicatory printing of Megillas Esther in 1976, to over 1,000 titles in stock today. ArtScroll publishes scholarly and popular works for the Jewish world from a Torah observant perspective. ArtScroll is best known for publishing the monumental, 15-year, 73-volume Schottenstein Edition of the Babylonian Talmud.